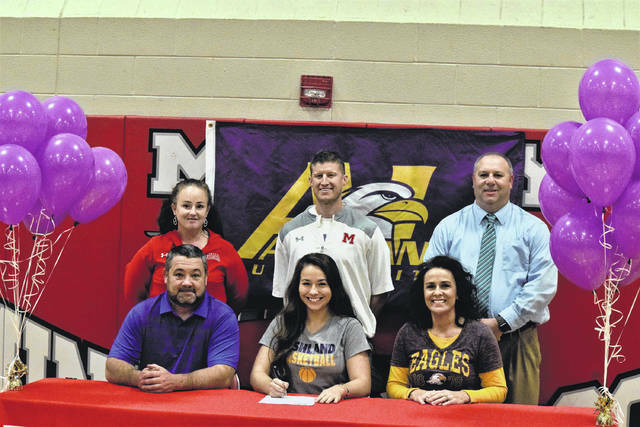 Minford’s Erin Daniels signed with Ashland University on Monday afternoon in a signing ceremony held inside the Minford High School gymnasium. Daniels, a First-Team All-District honoree, garnered averages of 17.5 points, 9.4 rebounds, 5.4 assists, and 4.6 steals per contest en route to being named as a First-Team All-Southeast District honoree while also obtaining All-Ohio accolades. In any profession, professionalism is always an important quality to have, regardless of the job or task that one is taking on. For Minford multi-sport standout Erin Daniels, however, the senior not only has the skills of leadership and professionalism in her arsenal, but has successfully paired those skills up with an aura that showcases a beyond-the-years mentality. On Monday evening, Daniels’ efforts as a student, as well as an athlete, were rewarded when the senior, a longtime commit to the Ashland University basketball program, officially signed her letter of intent to play basketball with the NCAA Division II Eagles — who have won two national championships in the last five seasons — in front of her family, friends, and coaches. As expected from a professional person that conducts herself like a senior in college instead of a senior in high school, the decision to attend Ashland, according to the roundball and soccer stalwart, was more than just basketball. However, it’s not just the signing, or the overall decision, that makes the signing so special for Daniels. In fact, since her sophomore year, the 5-8 guard, according to Minford head coach Scott Caudill, had eyeballed Ashland as a future destination — a belief that was confirmed to the fourth-year head coach during a bus ride back from Athens County during the 2015-16 campaign. Over the course of the past four years, Daniels has set nothing but a path of success for herself en route to blazing a trail rarely seen at Minford on the court and the pitch. In the soccer realm, Daniels was named as a First-Team All-SOC honoree in each season of her career while also obtaining First-Team All-District honors twice as a strong midfielder who showed excellent ballhandling skills at the top of Shane Tieman’s attack. However, from her early days, it was evident that girls basketball was the 5-8 standout’s true calling card. During her freshman year, Daniels averaged an astounding 15.5 points and 10.1 rebounds per contest to go along with six assists and 4.7 steals per affair en route to obtaining First-Team All-SOC, Second-Team District 14, and Second-Team All-Southeast District accolades, and, in the following year, not only matched, but even exceeded her averages from the year prior en route to collecting 16.5 points, 11.8 rebounds, 4.7 assists, and 3.7 steals per contest en route to repeating her All-SOC and All-Southeast District accolades and upping her District 14 standing to First-Team status. In 2016-17, despite facing numerous double teams as her role increased with a younger nucleus, Daniels used her heady IQ and maturity to display an efficient game, as Daniels obtained 17.5 points, 9.4 rebounds, 5.4 assists, and 4.6 steals per contest — all while shooting 52 percent from the field and 41 percent from three-point range in an impressive display that put the two-sport athlete on the First-Team All-SOC and First-Team All-Southeast District lists — en route to earning All-Ohio honors for the third time in as many seasons eligible. Those accomplishments, however, come with the amount of experience and poise that Daniels has had since her days as a young freshman. Not only has Daniels played in all 72 of Minford’s varsity contests since the beginning of her freshman year, she’s started in all 72 of them while leading Minford to a 47-25 overall record (65 percent) in the process. With one year left to play, Daniels already holds the girls basketball program’s all-time mark in free throws made, with 278, and, by scoring at least 354 points or more in each of her first three seasons of play, is well over the 1,000-point mark with 1,118, meaning that Daniels could very well reach the 1,500-point mark with a strong senior campaign. But Minford, as Daniels emphasizes, has given her a lot more than the ability to make an impact on the court or the pitch from Day One. It’s taught her how to work together, and trust in, a group or people en route to a common set of goals. However, the high school experience is one that Daniels has taken full advantage through her own hard work — both on and off of the floor. Academically, Daniels is a regular on Minford’s A Honor Roll list, and was named to the school’s National Honor Society for her work in the classroom. Then, there’s the character that Daniels conducts herself with — a trait that has shown up on numerous occasions, according to Caudill. When one combines the traits that Daniels has — class, hard work, and pure basketball skill — it really comes as no surprise that the 5-8 senior would receive such a high-caliber offer from the best women’s basketball program in the NCAA Division II ranks. Ashland, who hasn’t had a losing season since the 2002-2003 campaign when former head coach Sue Ramsey was in her eighth season coaching the program, has produced 17 wins or more per season in 12 out of the last 14 years, and have won at least 12 games in the Great Lakes Intercollegiate Athletic Conference (GLIAC), which is arguably regarded as the toughest NCAA Division II basketball conference in the country. When Ramsey, who won 367 games in a total of 20 seasons at the school, allowed Ashland to turn the corner by leading the Eagles to a NCAA Division II Runner-Up finish in 2011-12, an NCAA Division II National Championship in the 2012-13 campaign, and a NCAA Division II Midwest Regional Final appearance in 2014-15 en route to obtaining 113 wins over her final four seasons at the school, the longtime head coach turned over the keys to her assistant, Robyn Fralick, who has done nothing less than a masterful job over the past two seasons en route to obtaining an astounding 68-2 mark and the school’s second NCAA Division II National Championship this past spring. If that doesn’t prove Daniels is a special student-athlete, what does? Before her attention turns to continuing the standard of excellence that has been established at Ashland, Daniels wants to set a standard of excellence for all Minford Lady Falcons — both present and future — to aspire for on the court. But one could also argue that she already has set a bar that will long be remembered by those inside the Minford Local Schools umbrella.